Construction began in 1848 and it was completed in 1853. The building of roads to open the country for settlement and military purposes was one of the first concerns of the settlers and the government. Following old Indian trails, a Milwaukee-Watertown wagon road was constructed in 1837. Later this was planked and ultimately became Federal Highway 16 (sometimes locally called the “Oconomowoc Road”). 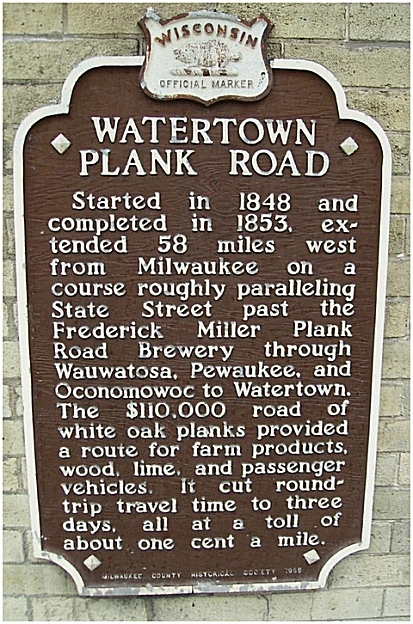 One of the most innovative aids to the transport of goods in the early pioneer days between Watertown and Milwaukee was the creation of the Plank Road, a wooden highway that roughly conforms to US Highway 16 today. 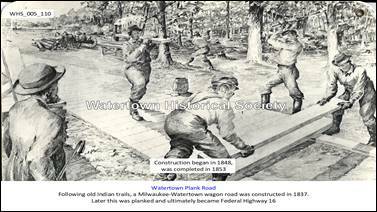 Started in the late 1840s, the road was finished as far as Watertown in 1853. Shipping goods before the invention of the plank road often took weeks at a time, but after the road was completed, the time was reduced to a matter of days. Known as the Milwaukee Plank Road in Watertown (and the Watertown Plank Road when it left Milwaukee), the road came into Watertown via what is today Oconomowoc Avenue, and turned onto Concord Avenue, then to Main Street. The road, originally a toll road, was abandoned with the arrival of the railroad in 1855 and was gradually taken apart and the logs discarded. The last toll house in Watertown, which stood along Oconomowoc Avenue, was torn down in 1999. “After the completion of the plank road, Watertown, early a place of promise, became the second city in the State and a bonanza for taverns; their story, however, has been well told in local histories. People and produce from the country to the west and north for many miles PASSED THROUGH WATERTOWN TO MILWAUKEE, and land seekers made it their headquarters. J. B. Van Alstine, for years the popular landlord of the Exchange, declared that he thought business dull in those palmy days unless he had a hundred guests and as many horses to care for. Two of the old taverns are still running [in 1915], the Watertown House, now the Commercial, and the Buena Vista, which was opened in February, 1848, by Capt. Henry Bogel, a veteran of the Mexican War. During the regime of William Wiggenhorn and his son, Eugene, the Buena Vista was the rendezvous of German revolutionist refugees, among them Carl Schurz and Emil Rothe, while on Sundays German services were held in its hall.” Derived from “The Taverns and Stages of Early Wisconsin” by J. H. A. Lacher, 1915. The first mention of a plank road for Wisconsin occurred in 1844 when a road was proposed from Milwaukee to Prairieville (Waukesha) or Mequanigo (Mukwonago). This proposal did not receive too much attention, and it was not until 1846 that the first of 133 plank road charters was granted. It was given to the Lisbon and Milwaukee Plank Road Company by the territorial legislature which authorized it to capitalize at $50,000. The road was to be constructed of timber and plank, "so that the same form a hard, smooth and even surface," from Milwaukee to Watertown or any part of the way. Interest in the proposed road soon lagged, but when residents of Watertown held a "plank road ball" in the American House there in February, 1848, and when extensive rains came that spring, making dirt roads almost impassable, subscriptions of stock in the plank road company picked up and the total stock issue of $50,000 was subscribed. An amendment to the road company's charter was approved by the territorial governor on March 1, 1848, changing the name of the company to the Madison, Watertown, and Milwaukee Plank Road Company, and authorizing an increase in capitalization to $300,000. James D. Doty was elected president and Alexander Mitchell treasurer. On August 8 the board let contracts for "grubbing," grading and clearing ten miles of the road between Watertown and Oconomowoc, but interest tagged again until a new meeting was called and Elisha Eldred was elected president. Alexander Mitchell remained as treasurer; William A. Prentiss was elected secretary. Eldred became the driving force behind the project. Contracts for the actual construction of the road were let in October of 1848, and work was in full swing by the next month, though the amount of cash on hand, due to the installment payment plan for stock subscriptions, was probably between $12,000 and $13,000. The cost of a plank road was about $2,000 a mile. Wisconsin residents were lacking in capital but this could be overcome by having farmers along the route take small stock subscriptions and pay for them in material and labor. Experience of plank road builders in central New York state led Wisconsin promoters to expect 25%. if not 50% earnings on stock. Plank roads are basically just what the name implies. The first construction step was the clearing and grubbing. In flat land the trees, stumps, roots, and other obstructions were removed from the width of road. After the roadway was cleared, it was graded for a width of 24 feet between ditches. The center of the road was raised six inches higher than the sides with a gradual inclination to the ditches. Before the actual grading was done, the roadway was ploughed to a depth of eight to twelve inches and thoroughly dragged to pulverize the earth. The stringers, upon which the planks were laid, consisted of white oak boards, one and one-half inches thick, eight inches wide, and not less than twelve feet long. They were laid in trenches so that the upper surface of the stringer was level with the earthen road bed. The outside stringer was set one and one-half inches lower than the other, and eight feet in width was allowed between the two, though in portions of the road near Milwaukee the stringers were laid 12 feet apart. The space between stringers was filled with earth to one-half inch above the surface of the stringer. The one remaining step was the placing of the actual planks. They consisted of oak boards three inches wide and eight feet long. They were placed on top of the stringers and pounded down with a heavy maul until they rested on the stringer. The planks were not nailed down or fastened in any other manner. This proved a disadvantage when the road was engulfed by high water, as the planks would float away. It was done because nails or similar objects would work loose and injure horses' hooves. The road mainly followed the old Madison Territorial road. In Milwaukee there were two forks. Traced on a modern day map of Milwaukee and vicinity, the north fork would begin at 12th place and Juneau avenue, the south fork at 11th street and Kilbourn Avenue. The two forks would come together at what is now 15th and Highland Boulevard. The road zig-zagged to 35th street and then followed State street into Wauwatosa. Crossing the Menomonee river on the Harwood Avenue bridge, the plank road continued westward through Elm Grove on a route still known as the Watertown Plank road, connecting with the Bluemound Road at the Durkel house. Winding along the Bluemound Road to Goerke's Corners and then northwest along County Trunk SS over the Pewaukee and Fox rivers to Pewaukee, the planked thoroughfare continued on the old U.S. Highway 16 and crossed the Oconomowoc and the Rock rivers before entering Watertown. Once the work on the road was begun, it continued without any serious interruptions. By 1849 ten miles of the road were in use near Milwaukee, and the portion between Oconomowoc and Watertown was graded and grubbed. In September of 1849 the board closed the books to additional stock subscriptions. Although there is no definite record of how many shares were sold, the Milwaukee city directory of 1854 listed the capital stock at $105,460. At $10 per share, this would indicate 10,546 shares. These were sold to an unknown number of stockholders, but by November of 1850 the total stock was held by 70 persons. By the end of 1850, 38 miles of the road were either planked or well graveled. In June of '53 the road was finished to the bridge in Watertown. The new road was 58 miles long, the longest plank road in Wisconsin. Its reports were, without exception, favorable, and it was labeled "one of the best laid roads in the Union." The only disrupting influence on the road was excessive rain. Low grades were often submerged and planks floated away. Generally, however, the company was prompt in repairing these breaches. The cost for the 58 miles was approximately $103,000, not including toll houses, bridges, etc. which would raise the total to almost $110,000. The road was highly successful. Before it was constructed the round trip from Milwaukee to Watertown required four days in good weather, six days in bad. Loads varied from 1,500 pounds to 2,000 pounds, depending on the condition of the road. After completion of the road, the time needed for a round trip decreased to three days and the average load increased to 3,000 pounds, regardless of the weather. This combination of shorter time and larger loads cut freight rates about 25%. For example, the cost of transporting building stone, from a quarry 4 1/2 miles to Milwaukee dropped from $9.50 to $7.50 per cord. What was hauled over the new road? Wheat was by far the leader in Milwaukee-bound loads though wood and lime were brought here in fairly large quantities. Not only did haulers benefit from the new road, but stage travel increased three fold and tolls from pleasure vehicles were reportedly enough to pay upkeep. With the completed road in use, the company erected toll gates at five mile intervals. One gate was a short distance east of Hartland, and another between Nashotah and Okauchee. 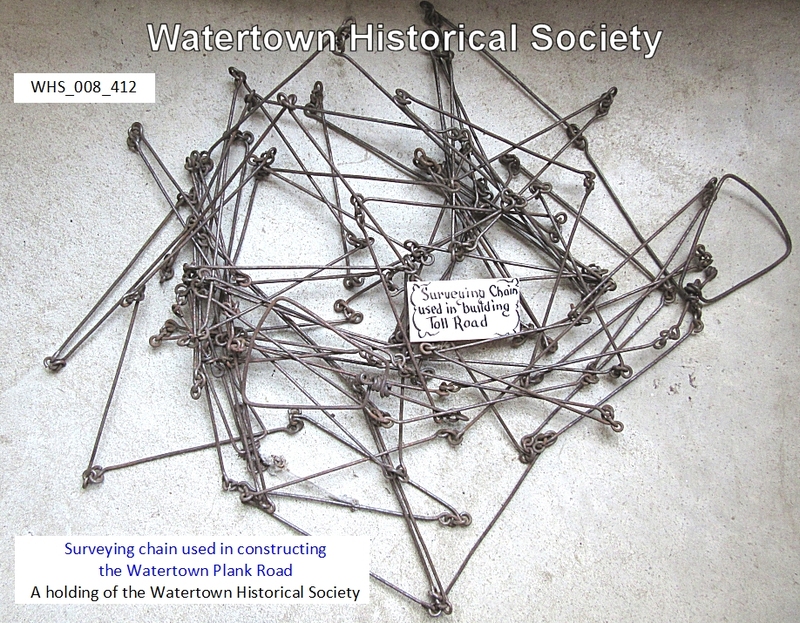 This pattern allows for gates near Watertown, at the crossing of the Rock River, near Oconomowoc, at the bridge over the Fox River, and at the Dunkel house. The gates nearer Milwaukee were constructed independently of the others, to benefit from the greatest traffic. (As late as 1892 there was a gate where the plank road intersected 35th street, and another near what is now the County poor house.) Tolls averaged $600 per week when the road was completed. The basic toll was l cent per mile for every animal drawing a vehicle although the total fare for a one-way trip over the 58 miles was 66 cents. A dividend to stockholders of 7% was declared on January 1, 1852 and others of similar amount followed until 1855. There was no public notice of any dividends in the following years, but in this period annual earnings were reaching 25%. The stockholders of the Madison, Milwaukee and Watertown Plank Road Company might well have read the Milwaukee newspapers of February 25, 1851 with alarm. For on this day the Milwaukee and Mississippi railroad was completed to Waukesha, a sign of the far greater competition to follow. 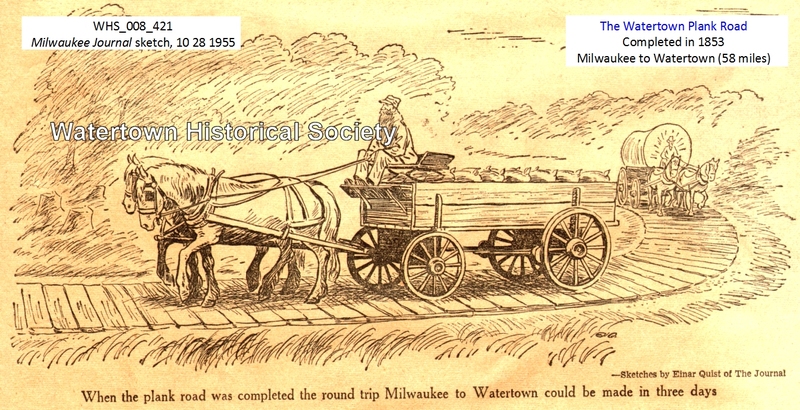 That competition was not slow in coming, for the Milwaukee and Watertown railroad was completed to Watertown in 1855. With the coming of the railroad, the plank roads in general, and the Watertown road in particular, passed into obscurity. Milwaukee newspapers contained practically no mention of the road after the railroad was completed in 1855. Many of the stockholders of the plank road, however, were active promoters of the railroad. Elisha Eldred, the president of the Watertown plank road, and Eliphalet Cramer, a member of the board, were also members of the board of directors for the Milwaukee and Watertown railroad. Other promoters and stockholders of the plank road who were active supporters of the railroad included Alexander Mitchell, Joshua Hathaway, William A. Prentiss, James Rogers, Hans Crocker and Levi Blossom. In 1863 the plank road was depicted as being in wretched condition. It was "broken and dilapidated" and "dangerous to drive over." It was transferred from private to public ownership after the legislature of 1887 authorized such action. City Plank Road—It is well known by the most of our readers that the two plank roads which are built from Watertown do not come into the city limits, but terminate near the corporation line. This, consequently, at some seasons of the year, leaves a piece of very bad road between the termination of the planking and the business part of the city. Pursuant to a resolution of the Common Council of the city, a committee consisting of Messrs. A. F. Cady, John W. Cole and S. Ford, was appointed to superintend the grading and planking within the limits of the city. Immediate steps were taken by the committee and about 60,000 feet of plank contracted for, and 40,000 feet more in course of negotiation, making in all 100,000 feet of plank, delivered on the line of the road at $8 per thousand. The workmen commenced laying the plank on Thursday last, and the connection will be made with the Milwaukee road during the coming week. The road west of the [Main Street] bridge to the Western Plank Road, during the wet season, is almost or quite impassible for loaded teams. As soon as possible, a gang of men will be set to work and the plank laid, so as to give a continuous plank road through the city. The Western company are pushing on their work so that no hindrance will occur to teams in any kind of weather. We have often extolled plank roads as a great convenience to the farmers though they do have to pay for the privilege of travelling upon them. We have, however, been led to doubt their advantage in a commercial point of view, when located between an interior village and a lake port. They have a tendency to carry away produce beyond us, when the policy would dictate to our merchants to purchase here, and thereby secure the money which the farmer disburses on selling his grain, instead of having it left in Milwaukee. A prospect of getting a few cents more in price will induce many men to carry their grain to Milwaukee, over the plank road. The only remedy for this state of things is a railroad between these interior markets, and the lake towns. Farmers cannot compete with a railroad in carrying grain, therefore they will find it to their advantage to sell at the nearest R. R. depot. This consequently induces a home market, and the money laid out for necessaries by the farmers retained in the interior. This is what we want at Watertown. If our theory is good in regard to plank roads from here to the Lake, it will prove good when they are built from Watertown to the West, South-west, or North-west, provided of course that we have a Railroad from here to Milwaukee. A farmer can never find it profitable to carry grain to Milwaukee for six cents a bushel, when a railroad can. If, therefore, the building of plank roads from Watertown into the country west, southwest and northwest, can be accomplished, it will enable the farmers of those regions to find a ready market at this point, and by purchasing their goods here they will materially add to the prosperity of our city. We think if our city had loaned its credit for the building of a plank road from here to Beaver Dam, and from here to Cambridge, in Dane county, that we should have received a greater benefit than from the construction of a railroad from here to Berlin, at the present time. We should have enabled the farmers to get their grain to market at all seasons of the year, and as every farmer has more or less to purchase, they would leave a large amount of money in circulation among us, besides giving our splendid mills a sufficient occupation, in manufacturing the wheat into flour. Three years since, before the completion of the Plank Road, over 150,000 bushels of wheat was purchased in this village in one season. We can account for the falling off only by the fact that the completion of the plank road gave farmers a choice of markets. They found they could pay the tolls on the plank road and still make carriage to Milwaukee a matter of profit, rather than sell here. We therefore hail the early completion of the Watertown Railroad as one of the greatest moments to the prosperity of our city. It will be the means of creating a large retail trade, and a commercial centre for a large extent of fertile territory. One of Watertown's historical landmarks disappeared from the scene last Friday. It was a quiet death and was probably witnessed by only a handful of people. And, for the most part local residents probably didn't really recognize its significance. We're talking about the old toll house, which was the end point for the old Watertown Plank Road back in the 1850s. 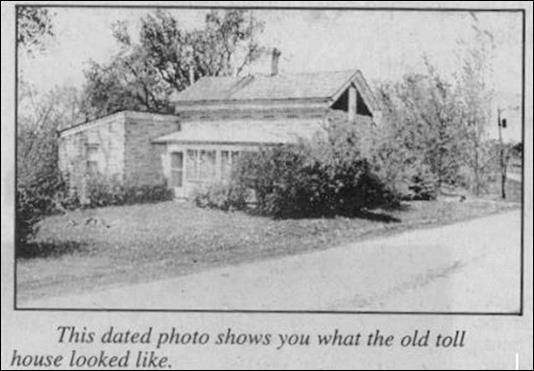 The toll house had stood at the same location on East Gate Drive for nearly 150 years, collecting tolls from people traveling along the route between Watertown and Milwaukee and all points in between. The old toll house was located on the south side of East Gate Drive, a little ways past the little inlet to the Rock River. The property has river frontage and it's only a couple thousand feet east of Settler's Bay, also on the Rock River. That was the best possible way to travel back in those days. It reduced travel times between Milwaukee and Watertown by about one-half. Before the road it took about six days and after it was constructed the trip could be made in three to four days. What happened to the landmark? Well, first of all, it was never registered as a national historic place, and it really had little value other than as a home to the owners, Randy and Gloria Kuckkan. The Kuckkans, who are the owners of Firehouse Lanes, Bar and Grill on North Water Street (another historical building, but we'll get into that another time), had lived in the old toll house for the past 25 years. Several years ago they made a decision to have the building razed and the property used as the site for their new home. That's exactly what happened last Friday. The wrecking crew came in and razed the home and construction of the new one is already under way. 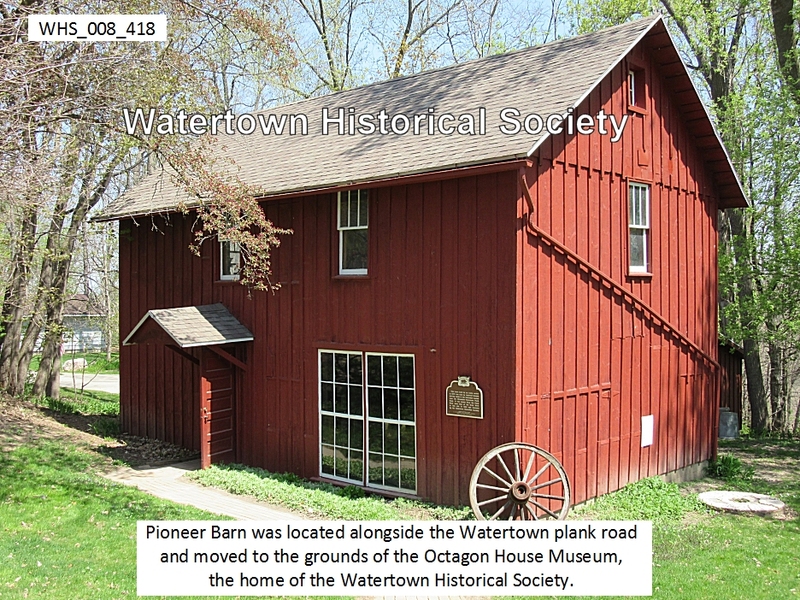 Although the home is not in the city limits and the original building is now gone, it might be nice for the city and/or the Watertown Historical Society to see if somehow there could be a small plaque erected that would note the significance of the site. You know, after some generations, it's likely that site will become a forgotten part of Watertown's rich history but, we'll leave that up to the Kuckkans and the historical folks as to whether or not that is appropriate, and not just a nuisance for the Kuckkans. We talked with Randy about the old home and he said there was really nothing of significance that would tie the home to its original use as a toll house. By the time they had acquired the building 25 years ago, any artifacts had already been taken and preserved. 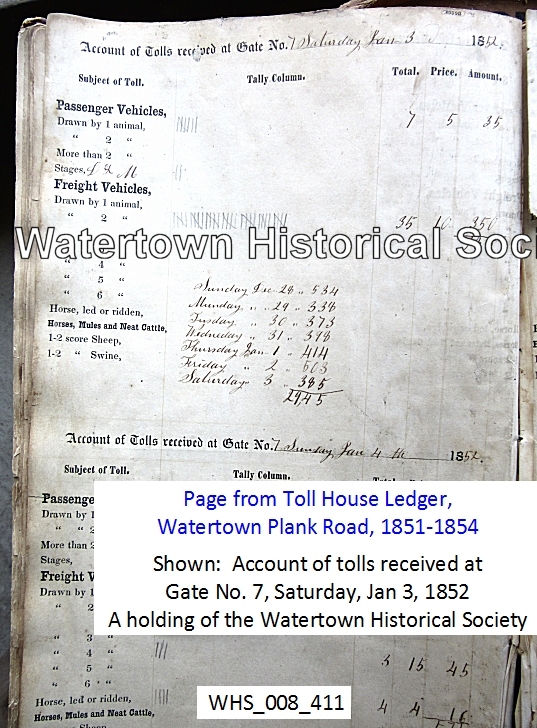 For example, some of the original financial books of the toll road are now at the Watertown Octagon House. He said the one thing significant was the fact that the boards were all nailed with the old style square nails. He added the building appears to have had several additions over the years. Many of our readers probably don't have a good knowledge of the old toll road, and because of this change in the local landscape, this might be an excellent time to review the history. First of all you have to envision that most travel out this way back in the 1850s was through openings in the thick forest or a winding path through meadows. This was a pretty primitive lifestyle back then. Remember, Timothy Johnson first came on the scene in 1836 and we're talking less than 20 years later. A lot of people were coming out this way back then, but progress was slow. 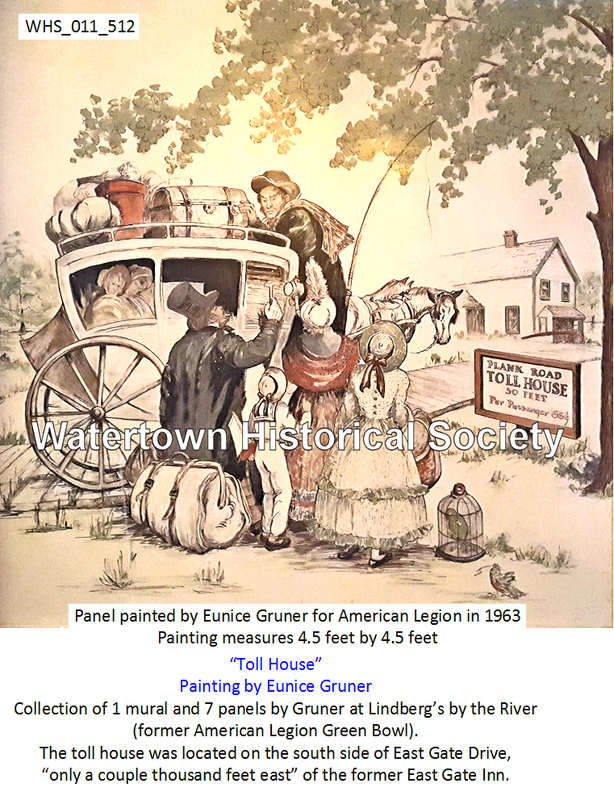 Back in 1853 when the toll road reached Watertown, we were officially chartered as a city rather than a village, and our population was listed at 4,000, the second largest city in the state. 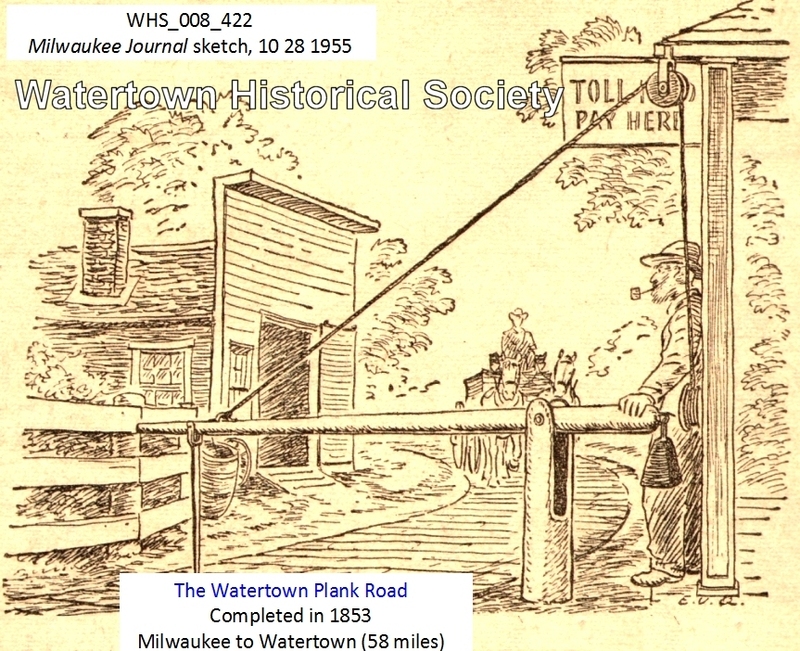 The old toll road started in Milwaukee and then traveled through Elm Grove and Goerke's Corners (now the approximate location of 1-94 and Highway 18 in Waukesha County), along County Trunk Highway SS to Pewaukee and then along the old state Highway 16 right of way through Hartland, Okauchee and Oconomowoc before arriving along East Gate Drive on the city's east side and ending at the old toll house where the tolls were collected. The toll road back in those days was called the farmer's railroad. It was used to bring produce and other products to this growing city. It was built before it was feasible for railroads to be constructed out this far, and it certainly was more economical that laying of tracks and operating a train. But, the train wasn't too far behind. The story of the Watertown Plank Road goes back to 1846 when the Lisbon and Milwaukee Plank Road Company received a plank road charter from the Wisconsin territorial legislature with the road to be constructed between Milwaukee and Watertown or any part of the way they deemed feasible. Interest in the road grew a great deal in 1848 when some heavy spring rains made travel on the old dirt paths almost impossible. Construction actually began in November of 1848 at a cost of approximately $2,000 a mile. Funds were raised through the sale of stock in the company. Imagine, that was $2,000 a mile and today a freeway costs several million dollars a mile and that's only if there's smooth sailing and no bridges. The total cost of the 58 mile road was $110,000 and it was completed in 1853. The center of the road was about 6 inches higher than the sides. Before grading, the roadway was plowed to a depth of 8 to 12 inches and was thoroughly dragged to make the dirt more solid. The plank road was built like a sidewalk or a wooden floor. The stringers were 8 inches wide, 1 1/2 inches thick and 12 feet long, all of white oak. They were set 8 feet apart. The outside stringer was about 1 1/2 inches lower than the other. The space between the stringers was filled with dirt about a half an inch above the top of the stringers, and then the surface boards were placed. Only one-half of the road bed was planked. The half used for a turnout was left in dirt. The oak planks were placed on top of the stringers and on top of that was a half an inch of dirt. The planks were pounded down with a heavy mall until they rested on the stringers. The planks were not nailed. This was because the spikes would eventually work loose and be damaging to the hooves of horses. A lot of farmers along the way purchased shares of stock in the plank road and paid for them with donated material and labor. Work on the plank road went along at a rapid pace for that era. By 1848, 10 miles of the road near Milwaukee were completed and clearing was under way all the way out to Oconomowoc. By the end of 1850, 38 miles were either planked or graded and in June of 1853 the entire road was completed. It was the longest plank road in Wisconsin and it was a real boon to the area. It cut travel between Milwaukee and Watertown to three days as compared to up to six days before the road. And, all it cost was about one penny a mile. Every five miles there was a toll booth. An old toll gate book from this house is preserved at the Watertown Octagon House. It showed traffic on the plank road was divided into three categories. One was passenger vehicles, another was freight vehicles and the third was animals. An entry for July 1, 1853, showed 11 passenger vehicles, each drawn by one animal, at 5 cents per vehicle; 39 freight vehicles, each drawn by a single animal, at 10 cents per vehicle; one freight vehicle pulled by four horses, 15 cents; three horses pulled or ridden, 3 cents each; and several other animals. All in all, it was a pretty good day with receipts of $4.71. The highest weekly total in that book was revenues of $89.03. Just about every day had note of a stagecoach traveling on the road. The stagecoaches were not charged which leads us to believe they were probably owned by the toll road company. Back in the era when the road was constructed, that area from what is now Lindberg's by the River east to the toll house was a village all by itself. The whole city at that time consisted of settlements and this one on the city's southeast comer was the largest. On the southeast corner of Oconomowoc and Concord avenues was the historic Boston House, a well-known business. It included a large dance hall. Travelers over this section of the plank road always looked forward to a stop at the Boston House. 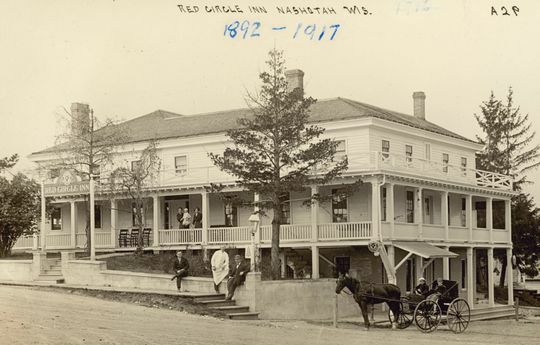 Other places of interest in that settlement were the Wisconsin House, another hotel located across the plank road from the toll house and now state Highway 16, Rasch Brewery, Wenzel Quis' store, and the Kadish store. Part of the road which traveled through the city was also planked. Watertown's Main Street back then was a tamarack swamp as was much of the territory over which the road traveled and the planks were necessary for travel. As we were reading a little history on the toll road we were surprised to see the road extended to Madison at one time. We didn't recall that leg of the road. The report we read indicated travel was much lighter on that segment because of the few settlements between Watertown and Madison. Things were going quite well on the plank road until the trains arrived. It was reported that back in February of 1851 the trains were in Milwaukee's Menomonee Valley, and four short years later the Milwaukee and Mississippi Railroad entered Watertown. That changed the whole dynamic of travel. Both freight and passengers could be moved much faster by rail than by the Watertown Plank Road. As we mentioned earlier, there were some Watertown investors in the plank road venture. Among them was John Richards, builder of Watertown's famous Octagon House [reportedly also surveyor for the plank road]. He was one of the directors of the company. William A. Prentiss, a cousin of Watertown's first mayor, Theodore Prentiss, was also a stockholder. The name Watertown Plank Road is still preserved, having been used for a modern blacktop and curb and guttered road in Milwaukee County. In addition, a plaque marking the route of the plank road is located on one of the Miller Brewing Company properties in downtown Milwaukee. So, there you have the basics on the Watertown Plank Road and the old toll house that was razed late last month. In pioneer days, when roads consisted either of mere openings through the forest or rutted trails across prairies, private companies built roads of plank. The only two toll books known to be in existence in Wisconsin which were used in connection with the early plank roads have been brought to the attention of the state historical society. The two toll books were used from 1851 to 1854 at gate No. 7 near Watertown on what is now highway 19. They still carry an interesting story in spite of the fact that they had been used as scrap books for newspaper clippings by their owners, Nellie and Jennie Needham, one of whom was born in the toll gate house. Cross Reference: August Needham originally owned and operated the Toll House on the west end of the Watertown Plank Road. A charge of 5 cents was made for a vehicle drawn by one horse and of 10 cents for a freight vehicle drawn by two horses. A shilling was charged for three horses or other animals and 15 cents for four animals. No charge seems to have been made for passengers, for foot travelers or according to the weight of loads. The amount of business varied from $5 to $100 a week, with the heaviest week being that of Oct. 15, 1854, when $99.16 was taken in. Benjamin Piper was an adventurist pioneer who left New York in 1835 and settled on a parcel of land that he claimed near Milwaukee. At that time Milwaukee consisted of five or six frame dwellings, a small tavern, fifteen or twenty log cabins and one or two grocery stores. The following spring he went to New York for his family, to live with him on the land he claimed. In 1837 he ventured to the Rock River country which brought him to Watertown where he found a few log huts along the river occupied by settlers who were also seeking prospects (land to be claimed). He then made a claim on some land above Johnson's Rapids, located near the present sight of the Bethesda Lutheran Home in Watertown. He then went back to his home and family near Milwaukee. A few months later he revisited his claim in Watertown with his two sons Harrison and Elijah. They built two log cabins, one for an old friend, a Mr. Adams, and one for himself. Having gone back again to his family near Milwaukee, he disposed of his claim there, brought his family and settled in section 30, which was then known as Watertown. He purchased land from the U.S. government on August 20, 1839, (now known as the Claude Hauser farm) and was considered the first settler in the southwestern part of the township now known as Pipersville, which was named after the Piper family. In 1837 a road opened from Johnson's Rapids to Milwaukee called the Plank Road. Mr. Piper was impressed with this road and built an inn on his property serving the farmers that hauled grain they raised to the nearest market, which was Milwaukee. The Plank Road was a highway on which a team could haul twice as much as it could on a muddy wagon trail. Farmers brought small loads of grain to a large platform which Mr. Piper built. Here they were combined into larger loads and hauled to Milwaukee on the Plank Road. Many times buffalo robes were used by the farmers who slept on the floor by the fire place because the inn was so crowded. Mr. Piper was an unofficial postmaster, and it is said that Mr. Piper used a wash stand drawer in a back room as post office facilities. Jonathon Piper came to Pipersville in 1847. Depending on power furnished by the dam which extended across the Rock River to a small island, he soon built and operated a saleratus factory just south of the present bridge . . .
. . . The coming of the railroad was responsible for the location and growth of Ixonia. Ixonia Center was the common name given at that time. In its infancy there were two stores, a saloon, one blacksmith shop, one turning shop, two shoemakers, a cheese factory, a grain elevator, a church and a public school. In 1922 the plank road was relocated from its location south of the railroad tracks to the north of the tracks. It has been the main route through Ixonia from its very beginning and was later called Highway 19. A street leading to the north from Highway 19, in the village was another established busy street. In 1924 Highway 19 was widened to 24 feet and paved. A curb, gutter, and storm sewer were installed. The storm sewer being financed 100% by the state because it was a state road at that time. The village homes and businesses were established on both sides of the two streets, now called Marietta Avenue and North Street. The village experienced heavy traffic from the east to the west passing through continuously until 1956, when Highway 16 was rerouted to bypass the town . . .
. . . To open the country for settlement and military purposes, new routes for traveling became a necessity. Many old Indian trails were replaced by wagon roads. A wagon road which today creates a special interest to the Ixonia township is the road constructed in 1837, which was later planked and called the Plank Road. On a historical marker erected in 1956 located approximately one-half mile east from the center of the village, the following information may be read. "In 1917, the Wisconsin Highway Commission engineers recommended and inaugurated with the Legislature's authorization, the first statewide system of identifying highways by number. This highway was designated State Trunk Highway 19 (later U.S. 16) and was the first to be marked and signed by numerals. The now familiar number system was later adopted by all other states and many foreign countries" . . .
. . . In the early 1900's, new road beds were made by pulling a heavy reversible road machine by a team of six horses; and to maintain them, a small grader drawn by two horses was used. The winters were extremely difficult in the pioneer days. The deep snow in the roads was avoided by making a trail off the road, around the banks, and through the fields, cutting the fences when it was necessary. Again manual labor and shovels were used to take away the snow to such an extent that the road equipment available in those days could then handle it. When the snow built up between the wagon tracks, a one horse walking plow was mounted to the side of a bob sled runner, turning the snow out of the track. This also loosened the snow for better driving conditions. After the snow disappeared, a mud problem was created by the freezing and thawing conditions. Often times stones were filled in some of the mud holes in the roads and road drags were used to level off the road beds. 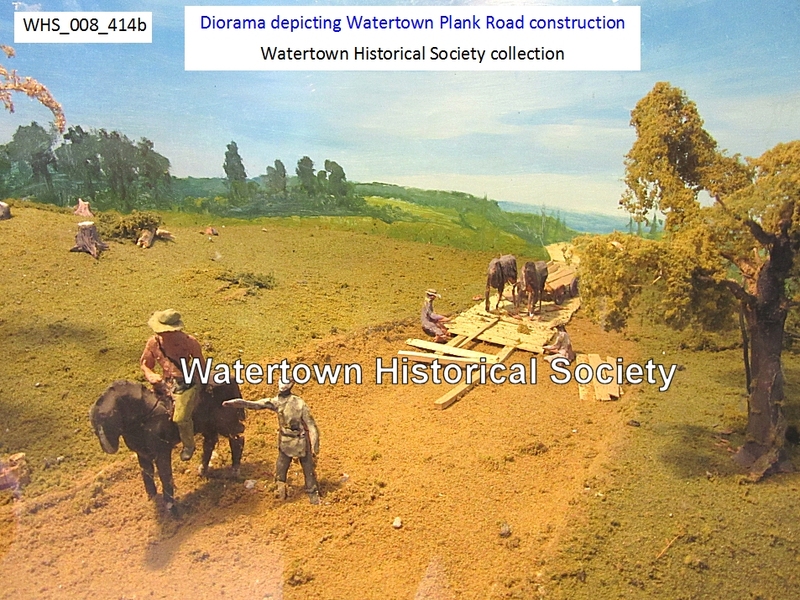 With the intent to improve the Watertown Plank road, a stone crusher was purchased in 1914. A year later the east end of the plank road to the village was surfaced with crushed stone and oil. In 1917 the west end was surfaced in the same manner. One half of the expense of both projects was funded by the state. The distance to improve these two sections of road was determined by the amount of funds available. In 1922 the highway was relocated from south of the railroad tracks to the north side, now a street through Ixonia. More stone crushers were purchased and soon disposed of because of continuous break downs . . .
Because of its proximity to Milwaukee the growing settlement of Watertown seemed a logical terminus for a road as well as for a railroad. During the decade of the 1840's the Territory of Wisconsin, moving toward statehood, drew settlers from the east and from foreign countries. It became necessary to construct serviceable roads in place of the wild trails which were often impassable and imposed much hardship on travelers in Wisconsin. The first agitation was, naturally, for such water traffic was possible, and for construction of canals to further that traffic . But waterway travel was not practical into many parts of Wisconsin, and it did no permit the movement of large numbers of people and their belongings. The next agitation was for plank roads, and the first of these roads was constructed to Watertown from Milwaukee in 1847, at a cost of $119,000. This was a toll road, and a toll house stood in Watertown after its completion in 1850. Meanwhile, however, even as plank roads were being built, the iron horse was preparing to invade Wisconsin. In the very year of the beginning of the Milwaukee-Watertown plank road, a charter was granted to the Milwaukee and Waukesha Railroad Co. By 1855 the Milwaukee road had reached Watertown. And in November, 1859, the Janesville and Fond du Lac branch of what is now the NorthWestern Road, ran its first train into Watertown. The coming of the railroad was accompanied by an amusing incident when Michael O'Hara, the engineer of a locomotive approaching Watertown, not convinced that the two mile bridge east of Richards' Cut near Watertown would support his locomotive, started the engine, then jumped off at the head of the bridge, letting the locomotive go over alone to be caught on the far side by the waiting firemen. The Plank Road and the railroad connection Watertown with Milwaukee played an important part in the growth of the settlement along the Rock river. The waterpower at the site was soon harnessed for other saw mills and for factories to make carriages, barrels, wagons and firkins. 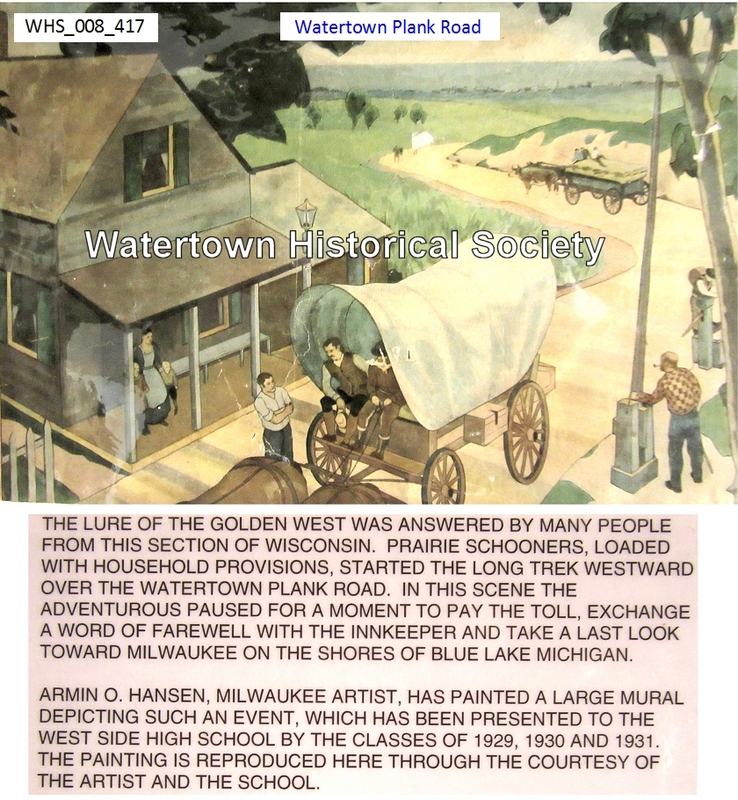 Even before these connecting links to the port city of Milwaukee, Watertown was being settled by German immigrants, many of whom were political refugees who had been university students and men in professions for which there was as yet no need in a new settlement like Watertown. As a result, for many years everything these men turned their hand to was a failure; they could not make shoes, they could not manufacture cigars, they could not even brew. When they congregated at the Buena Vista House, they habitually conversed not in German, but in Latin, as a result they were locally known as "Latin Farmers." The award-winning Red Circle Inn & Bistro, N44-W33013 Watertown Plank Road, Nashotah. 06 18 Plank Road Notice -- The meeting for the annual election of Directors of the Watertown & Waterloo Plank Road Co., is advertised in today's paper. -- -- Going west to St. Louis, Carl Schurz wrote: "I am taking a lot of notes and having many experiences which will come in handy. I am more and more convinced that we should be on easy street here in a couple of years. . . ." So it seems he was positively bent on getting rich quickly. When he reached Chicago on his return trip he found letters from his uncle, Jacob Juessen, who urgently invited Schurz to visit him and his family at Watertown, forty miles west of Milwaukee. He must have had such a side excursion in mind, for the uncle's letters were doubtless in response to suggestions of his own; otherwise the time of his arrival in Chicago would not have been known. On that trip he experienced for the first time the natural charms and material enticements of southern Wisconsin. The beautiful moonlight voyage on Lake Michigan by boat from Chicago to Milwaukee prepared him for a cheerful, but not quite openminded appraisal of the Badger metropolis. He found the combined rail and stage ride to his destination enjoyable rather than the reverse, a "splendid plank road" contributing to his satisfaction. Schurz was impressed with all he saw, calling Wisconsin a beautiful land. The development of the southern part of the state surprised him; he had expected to find it less well settled. It was already a fine, prosperous farming region. From “Margarethe Meyer Schurz – A Biography” by Hannah Werwath Swart, reprinted by the Watertown Historical Society and is now available in two formats, ebook and soft cover. Ald. Dutcher introduced a memorial praying the Legislature to vacate so much of the charter of the Milwaukee and Watertown Plank Road Company as lies between Watertown and Oconomowoc and establish the same as a Public Highway. Editor Leader: The people living on the Plank Road in the Mecklenburg settlement are kicking vigorously because of the indifference of the common council to their needs and convenience. For thirty seven years they had sidewalk, but about two years ago it was torn up by order of the council, since which time they have been obliged to wade through mud when the weather was rainy and their children remain out of school at such times. They have repeatedly asked the council to order the side walk restored but no attention has been given to their request, and they feel that they have just cause for complaint, and that the city authorities should give them the attention the conditions demand. It is a matter that should be investigated by the mayor and common council at the earliest possible moment and action taken in giving the people living out on the Plank Road a sidewalk. No 1: Daniel Jones was one of the originators of the Plank road, between Portland and Oconomowoc, and it was a good investment until the railroads came through. They ruined the business and I lost what I had in the enterprise. No 2: 1871 note on road condition: On the Watertown road but it is quite sticky. No. 4: 1998, Covered wagons once again rumbling down the old Watertown Plank Road. 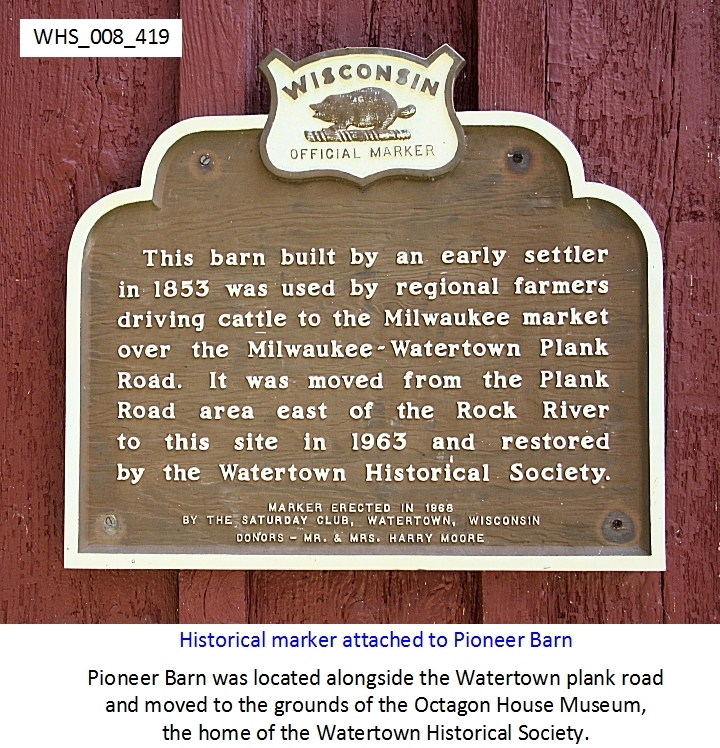 The Plank Road Barn was originally located along the Watertown-Milwaukee Plank Road a short distance east of its present site on the grounds of the Octagon House. Moved to the grounds in the 1960s, it now houses a collection of pioneer tools and farm implements.